Cats are surrounded with superstition, black cats especially so. In ancient Egypt, cats were revered, the black ones being most omnipotent of all. Often associated with good luck, they are popular talismans and have appeared on all kinds of ware. Sailors are fond of black cats, and at one time it was the custom for a sailor’s wife to keep one as a pet, to ensure her husband’s safe return from sea. If a strange black cat comes to visit your home, he brings good luck with him, but never kick him or you’ll get rheumatism (and you’ll also get a visit from the R.S.P.C.A.!) An early anonymous rhyme ran, ‘If the cat in your house is black, Of lovers you have no lack.’ In Britain, one of the best signs of good luck is to see a black cat crossing your path, and if you happen to be a bride just leaving the church, a black cat will ensure you live happily ever after. 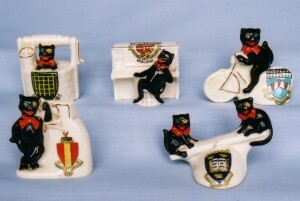 After the first world war there was a craze for lucky black cats in Britain, and ceramic versions were sold as holiday souvenirs, often featuring crests of the various towns and resorts. They were made from porcelain by such makers as Arcadian, Shelley and Carlton. Today, many of these black cat decorated crested wares are changing hands for £100 or so – a tremendous amount when you remember that at the time they were cheap novelties. 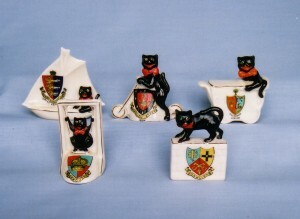 These pieces are made from creamy-white china, usually with the cats modelled onto them rather than painted on alongside the crest. Arcadian China was founded by Harold Taylor Robinson, who originally manufactured Carlton Ware alongside James Wiltshaw, emulating the Goss idea of making small crested china souvenir ornaments. A great entrepreneur, Robinson’s company became the most prolific and successful of the crested china concerns. Its wares were not as well modelled or as finely painted as Goss, but the vast range of items – every conceivable shape – plus the cheapness, attracted day trippers, holiday makers and those who wanted an inexpensive memento. His products were sold not only in seaside kiosks and gift shops, but in pubs and china shops throughout Britain. During the 1920s, Robinson was the largest employer in North Staffordshire; his Culdon Group embraced Arcadian, Wembley china, Coalport, Royal Worcester and Royal Crown Derby. Eventually he owned more than 40 other potteries making crested china, including Swan, Coronet and Griffin. In 1929 he took over Goss, but in 1932, something went badly wrong and he became bankrupt. Robinson decided to cash in on the craze during the 1920s by producing a range of 24 black cats, which he registered in 1924. The cats wore coloured bows and had odd-coloured eyes – one yellow and one green – and they were made as figurines seated on a horseshoe, in a boot, climbing a pillar box, playing a double bass, sheltering under an umbrella, in a canoe, playing a piano, talking on a telephone, riding a bike, sailing a boat, in a pram or riding a scooter. Further models featured black cats adorning milk jugs, boxes, dishes and vases. Welsh cats wore tall Welsh hats, Irish cats played harps while Scottish cats dressed in kilts and puffed at the bagpipes. The inventiveness of these little ornaments, produced by companies such as Carlton, Shelley and Willow Art, as well as Arcadian, is amazing, and there must have been a huge demand for them at the time. 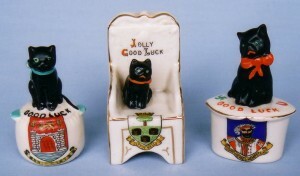 Some of the cats are seated on pots or chairs marked ‘good luck’ or, if they’re specially lucky, ‘jolly good luck!’ To modern eyes they are cluttered designs – a shaped piece bearing a black cat, a brightly coloured crest, a place name and a motto all at once, is rather over the top. Yet they are quaint, and a group of these 1920s ornaments can make a stunning impact. Even more amazing are those pieces featuring more than one cat, as, for instance, three cats in bed or riding a sledge, three kittens in a box with a larger cat sitting on the top, or the very rare five cats on a wall, their backs painted with the letters G.O.O.D. and their tails cleverly forming the word LUCK. This last piece is extremely had to find, selling for well over £100. Some of the black cat models look quite scary as not only do they have the strange odd-coloured eyes, they have wide red devilish grins, making them appear more unlucky than lucky! Arcadian also produced pieces with black cats transfer-printed on them, together with a slogan, such as ‘Good Luck from Wembley’, commemorating the British Empire Exhibition of 1924/25; black cat models bearing British Empire crests can sometimes be found as well. Carlton issued a pretty blue lustre jug with a horseshoe and a black cat, and a black cat on a hatbox printed with a crest and some white heather. 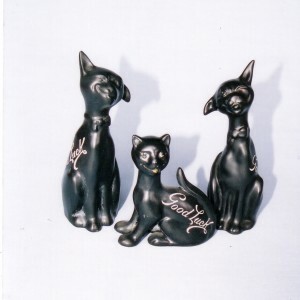 The Shelley company made a series of svelte black cat ornaments without crests, decorated with the sentiment ‘Good Luck’. One of the cutest items is a Carlton ashtray which features a black mother cat and kitten sitting upright, next to a container. The container is filled with matches, and the ashtray (which bears a crest inside), is inscribed, ‘Don’t Scratch Me, Scratch Mother’. The mother cat’s back has a rough surface for striking a match! Felix, the black cat who ‘kept on walking’, was dreamt up by cartoonist Peter Sullivan, and made his first appearance in an animation called ‘Feline Frolics’ in 1919. Exceedingly popular, his likeness was captured in plush and ceramic, and these early renditions are sought after today. Some of the first toys were quite scary, and, far from comforting a small child would no doubt have led to nightmares and a lifelong aversion to cats. Plush Felix cats were often thin faced with large grins and pointed, ratty teeth, bearing a resemblance to Mickey Mouse. 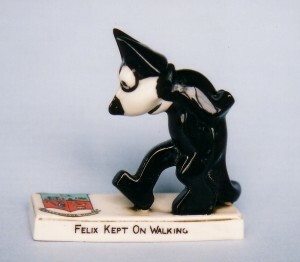 A whole series of ceramic versions of Felix were made by Carlton, the company once jointly-run by Robinson, showing the cat in typical upright pose, front paws behind his back, ‘walking’ across an armchair, ashtray, pillar box or settee. Many of the pieces were decorated with sprigs – or whole bushes! – of lucky white heather. If you have one of these pieces today, then you are certainly very lucky as Felix the cat ornaments are exceedingly collectable, with some of the best examples selling for £200 or so. Robinson never managed to enfold Carlton under his umbrella, which he must have found irksome. Carlton china tended to be of a superior finish to Arcadian, with clearer painting, though never matched the latter in terms of quantity and variety. Wilton produced a series of Pathe News small porcelain pots transfer printed with a Felix design, labelled ‘Felix the film cat’, and these too are quite valuable today. Felix is still much-loved – in 1997, Wade china issued a Felix the cat model, in a limited edition of 1500, perfectly capturing the look and character of the original. 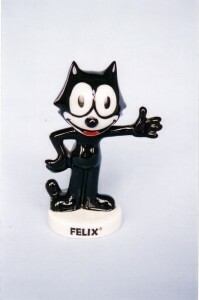 Two years later Beswick produced a Felix model in a limited edition of 1000. 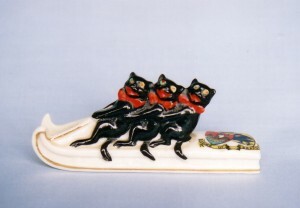 Of course, hundreds of potteries have made lucky black cat models over the years, from old favourites such as Sylvac, Beswick, Goebels and Wade to new sculptors Lorna Bailey, Suzie Marsh and Peter Fagan.